It seems like every day, a new idea for a smart assistant hits the crowdfunding circuit, and for good reason: The utility of having one in the home is only growing with their expanding abilities. 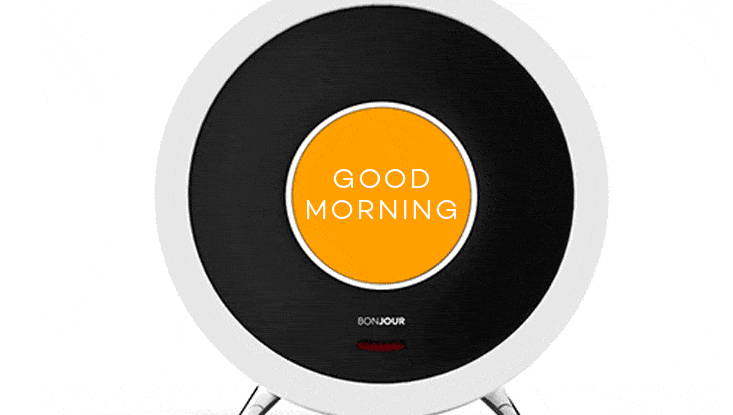 While the Bonjour Smart Alarm Clock is one of these, what sets it apart is its use of artificial intelligence to learn a user’s routines and habits, integrate itself with smart home devices, and be totally controlled using nothing but conversational language. The device is designed to be used in the bedroom to facilitate an easier morning routine. By simply asking it, users can get an update on the weather, traffic, and news, control products like Hue lights and Nest thermostats, and even play music through Spotify. It also can understand ‘if’ clauses in order to create customized parameters for the morning. (For example, a user can say “Wake me up at 7AM. If it’s raining, wake me up at 6:30AM instead.) Unprompted, Bonjour will update users on things like fitness through integrations with products like FitBit or travel based on calendar events. It even works as a sort of second mic for an already installed Amazon Echo, allowing users to control one in another room through Bonjour. All in all, the product’s two noise-cancelling stereo mics, colorful HD screen and five-watt premium sound system is packed in an extremely slick package that fits right into most living spaces with ease. Prices for the Bonjour start at $99 and is expected to ship in June 2017 should its campaign reach $50,000 by December 5th, 2016. The Bonjour Smart Alarm Clock’s use of artificial intelligence and focus on the bedroom make it a winner, especially combined with an Amazon Echo to fill in the gaps in terms of what it can’t do. By itself, it boasts a lot of versatility through its wide-range of integrations. With the Echo, the Bonjou becomes a sleek extension to an already useful product with having to buy another. Add in the fact that users can talk conversationally with it in order to control it and similar products like the Beddi seem just a tad lacking.